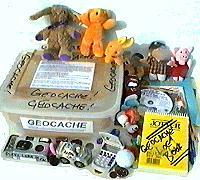 This site was set up in 2001 to support the promotion of Geocaching and good practice by Geocachers and Geocaching web sites. This is NOT a geocaching web site, and is not intended to become one. Most of the information below dates from 2001.
for Robin's thoughts in 2009, see the interview with a high school student in USA. Geocaching is a new "treasure hunt" hobby which relies on the Internet, GPS, and peoples willingness to get outside, in the open air. It only started in May 2000, in the USA, after the Americans switched off the deliberate error which had degraded the accuracy of GPS systems. 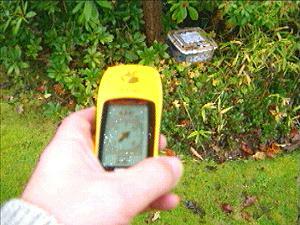 Now any cheap hand-held GPS will pinpoint your position and guide you to within a yard or two of the hidden geocache. These geocache positions are on the Net. What does a Geocacher do ? The majority of Geocachers simply search for geocaches planted by others. This may often be combined with a trip to, and a walk around, an area that they have not visited before. Other Geocachers will hide a container in an interesting location (historical, scenic, personal importance), and will post the GPS coordinates to a Geocaching web site page. The page will include the latitude longitude coordinates, a cache and terrain difficulty level, and a description of the area and/or container contents. It may also include what amounts to a "tourist guide" of the area illustrated with pictures. e.g. hints of good spots to visit or things to do. Those finding the cache will take an item, leave an item, make a log entry into the log book, and then post a visit report or "log" on the web site page. If they cannot find it, then this is also reported. What's in a Geocache ? The most important and essential item in a geocache is the log book, together with pens and pencils. Visitors write their visit in the book, along with whatever thoughts they wish to share with others. They will normally append a similar report as their "log" on the geocaching web site. The contents of a geocache will change, as people visit it, take things out, and put other things in. Many include an instant camera, so that visitors can take a picture of themselves, perhaps taken during a walk around the area. Other items might include small, low cost toys and "fluffy animals" to appeal to a wide audience. The most popular Geocaching web site for over 10 years is www.geocaching.com , run by Jeremy Irish and friends. Others since that time include www.navicache.com , run by Quinn Stone. These sites include facilities for you to get a list of hidden caches in a particular area, then see the page of details describing a particular cache. i.e, it's location, description, and perhaps tips on other interesting places to visit while you are in the area. Simple means are provided for you to add your "log" after your visit. For those planting caches, facilities are provided to upload the cache information including pictures. We understand that all these enterprises are even smaller in size and resources than Robin's small GPS Software business. However this may change rapidly if geocaching takes off worldwide, and the numbers of participants rise into the hundreds of thousands, or even millions. These pioneers are to be congratulated on what they have already achieved with skill, hard work and a significant part of their own spare time. footnote in October 2012: above was written in 2001 :-) There are now two relatively new geocaching sites: www.opencaching.com and www.opencaching.org.uk. Where are the Geocaches hidden by Robin and June in 2001 ? We recommend that you regularly visit all the geocaching sites above, checking what caches are listed in your area. 1st May 2000: GPS SA switched off: accuracy now typically 2 metres. 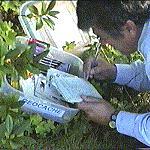 2nd May 2000: Dave Ulmer in USA plants the very first Geocache. November 2001: 10,000+ geocaches on this and other geocache sites. Dave Ulmer in the USA hid a box of "treasure" (a "Geocache") and posted the exact position (in latitude longitude) on a web site - challenging someone to find it. By January 2001 there were about 300 caches worldwide, and this rapidly increased to over 10,000 geocaches, with the numbers growing at over 10% per month. Of the million people who own a GPS in the USA, still only 30,000 know about Geocaching. In the UK there are probably fewer than 100,000 people who own a GPS and a few hundred who know about Geocaching - but these numbers are expected to grow rapidly. As more people participate, there will be more caches to find. This site has been set up by Tony Wale and Robin Lovelock. They are both newcomers to the hobby of geocaching, but they are most certainly not new to the field of GPS and navigation "on foot". They share the same enthusiasm and hopes for what this new hobby may become, and have decided to use a proportion of their time and resources to promote and perhaps influence how Geocaching takes off Worldwide. They have no need to profit from their activity, but are sufficiently experienced to know "how the real world works", including the need for geocaching web sites to be adequately funded and supported. provide your name, address and 'phone number on the geocache box. try not to skimp on quality, including the box contents, location, description. publish the cache description on all (three?) geocaching web sites. These are less easy to find anywhere, and is one of the reasons for setting up this page. The existing three geocaching sites, most notably geocaching.com, have done an excellent job of supporting the hobby with an ever increasing range of simple to use and powerful aids. These include being able to quickly find caches near you, look at their details, track object (Travelbugs) between caches, and being able to easily add new caches. However, it has yet to be seen if these web sites will cope if and when the general public discover geocaching, and the number of web site users increase a hundred-fold. The problems may not be technical ones, such as capacity and loading on the servers: in Robin's opinion these are more likely to be related to overload on those like Jeremy Irish who administer the web site, due to their current manual procedures. In the past there have also been examples where people have claimed ownership (copyright) on terms such as "Geocaching", or implied that their copyright on their web site html and asp logic extended to the information that they were hosting. If anyone owns the information such as location and description of caches, or logs of visits to caches, it is the geocachers who entered this information. It could be argued that this is all or mostly Public Domain information anyway. The geocaching sites are also vulnerable to enthusiasts uploading information such as a nice picture scanned from a postcard, which breaks copyright. Full contact details including name, address, telephone, email address and possibly declaration of business interest, for those given access to write information such as Geocaches, log reports, and newsgroup postings. This information to be kept private by those running the website, but available if needed by police, land owners, etc. This should provide some level of protection from the threats above. Similar information as above on the Geocaching web site administrator to be public. Simple process of submitting information such as cache descriptions or visit logs, where the person understands that he should submit "good" information without breach of copyright. Simple but clear statements on who owns the information hosted by the site. e.g. what is Public Domain (free to everyone as is Government mapping in the USA) or still owned by the person submitting the data. Continued ability for people to remain anonymous (where they do not trust the geocaching site administrator with their contact details) and use the site to find caches and participate in the hobby. This is very much a "first draft", and Robin will be grateful for feedback on this - particularly from those running the existing Geocaching sites who will already have an appreciation of the practical issues involved. He assumes the main issue for debate may be whether those logging cache visits should remain anonymous to the geocache site administrator, and under what conditions these details should be released to others such as landowners or police, or possibly made public to "shame" serious offenders. It must be emphasised that the above are simply "ideas for discussion". My most recent 'phone conversations were with Dave Ulmer, who started it all when he planted the first geocache in May 2000. He has some interesting ideas, including that sometimes the "place" is much more important than "what's in the box". In September 2001 there were 'phone calls between myself Robin, Jeremy Irish and Bryan Roth who own and maintain the geocaching.com web site (Grounded Inc). Contact was also been made with Dan Foster, founder of TopoGrafix, the software company behind EasyGPS, ExpertGPS, and PanTerra. More recently there have been 'phone conversations with the owners of two other Geocaching web sites: Quinn Stone of navicache.com and Jeremy Hurst of a third site now closed down. I understand that all these enterprises are even smaller in size and resources than my own small GPS Software business. However this may change rapidly if geocaching takes off worldwide, and the numbers of participants rise into the hundreds of thousands, or even millions. These pioneers are to be congratulated on what they have already achieved with skill, hard work and a significant part of their own spare time. Robin Lovelock, Sunninghill Systems, 22 Armitage Court, Sunninghill, Ascot, Berks SL5 9TA, United Kingdom. Footnote from Robin on 11th October 2015: Today we visited the "Leviathan" geocache near Esher, the second time - the first was in 2001 ! This must be the best cache in the UK - it still has that original 2001 log book with our visit report from then - Michelle, June and myself, could not believe it ! We read our 2001 entry in which Michelle said she's found the cache before me, then my words after her's, saying nobody liked a smart a*** :-) Thanks for planting this cache - just like the old days in 2001. I thought I would have to find an old copy of Microsoft Office, to make a PowerPoint Briefing, as a .PPT file to put here. However, found one on this PC, about NHSCare.info, for a Rotary Club, made on 24th August 2009, and it was done with Open Office. So here is a test to see if you can see it. It starts with the first slide below, then follows with the slides of my old briefing. I will obviously need to go up a learning curve ! See Draft Talk on Geocaching .